Prosecutors say the lead defendant Dave Stroj ran a $10 million illegal bookmaking business and launder the money through Seven Mile Casino and Palomar Card Club. Four other defendants who were arrested, faced a judged and pleaded not guilty. One of the defendants include a Tijuana Soccer Team owner and the former mayor of Guadalajara. 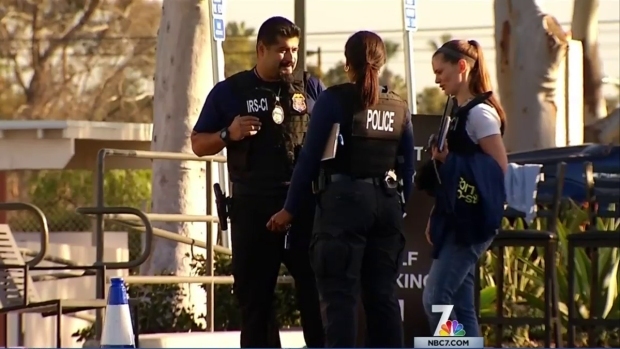 NBC 7's Liberty Zabala reports. The casino operator indicted in a $10 million, multistate gambling ring did not have the legal permission to operate the club in the first place, according to current San Diego city code. Naseem ‘Nick’ Salem is accused by the federal government of operating the Palomar Card Club without ensuring the proper reporting of winnings and conspiracy to launder money. The card room was raided Wednesday by the FBI. Salem declined to comment and his attorney could not speak with us today. He has entered a not guilty plea in federal court. Criminal Defense Attorney Marc Carlos who is representing another defendant in the case, spoke to NBC7 Monday about how long the federal government has been investigating the card rooms. "We spoke to them a year and a half ago and during this whole time they’ve been continuing their investigation and they had an investigation before that. So, they take their time, they’re methodical and they’ve got the information which they felt necessary to get an indictment and now we’re moving forward," Carlos said. The city’s current ordinance prevents the transfer of ownership or control of card rooms that aren’t already grandfathered in under current permits. Donald Staats, the actual owner of the Palomar Card Club, has one of only two non-transferrable card room permits left in the City of San Diego. That’s because of a 1985 sunset provision aimed at eventually eliminating all of the card rooms in San Diego. Back in 2014, the Palomar Card Club pushed for permission for Staats to transfer ownership and control of the casino. The Smart Growth and Land Use subcommittee heard their arguments in January 2014. Public relations consultant Alan Ziegaus presented the proposed change to the committee. “My staff committee consultant will be giving the report on these changes to the city cardroom ordinance,” said Councilwoman Lorie Zapf, chair of the committee. Ziegaus argued for the proposed changes which would prevent the card clubs from going out of business, he said. “We believe if this doesn’t change and they’re forced to go out of business, the card players would just go outside of San Diego to play. They’re not going to stop playing cards. They would just go to a different venue,” Ziegaus said. Two former council members, neither of whom were directly involved in the debate over the proposed card room changes, said it’s highly unusual for an industry representative to present a proposed change in city ordinance at a committee meeting. Typically, city staff presents the information and considerations to committee members, they both said. The Smart Growth and Land Use subcommittee voted unanimously to change the rule that prevented Salem from operating the casino. But that item never came to a full council vote for unclear reasons. Council members Scott Sherman and Zapf voted to support the requested changes. “I know in the past, card rooms had a little bit of a nefarious reputation and issues with police and public safety, and I don’t see anyone from the police department here,” Sherman said before he asked how many calls for service the casinos had received in recent years. Ziegaus responded that there had only been one – a car crash in front of one of the casinos. “As a business owner, that’s one of the reasons you start a business, to build up something to leave as a legacy to your kids and grandkids, and I’d hate to see the city stand in the way,” Sherman said before motioning the committee send the item to the full City Council.